"I'm not sure when I was first dubbed 'The Great Communicator', but I have always been proud of that title. If I have in any way earned it, I hope it is because I have always tried to speak from the heart to you, the American people. God bless you for the privilege of allowing me to do so." "A young man whose father is a carpenter grows up working in his father's shop. One day he puts down his tools and walks out of his father's shop. He starts preaching on street corners and in the nearby countryside, walking from place to place, preaching all the while, even though he is not an ordained minister. He never gets farther than an area perhaps 100 miles wide at the most. He does this for three years. Then he is arrested, tried and convicted. There is no court of appeal, so he is executed at age 33 along with two common thieves. Those in charge of his execution roll dice to see who gets his clothing - the only possessions he has. His family can not afford a burial place for him so he is enterred in a borrowed tomb. End of story? No, this uneducated, propertyless young man... who left no written word... has, for 2000 years, had a greater effect on the world than all the rulers, kings, and emperors; all the conquerors, generals, and admirals; all the scholars, scientists, and philosophers who have lived - all of them put together. How do we explain that? ...unless he really was what he said he was. 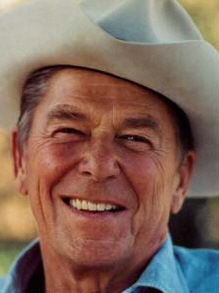 It is with great sorrow and grief that we mourn the loss of one of America's greatest presidents, Ronald Wilson Reagan. He was a true servant leader and he will be sorely missed by all of us who loved not only the man himself, but the spirit and principles for which he so strongly and defiantly stood.